We're closing the week out with a new author page for poesia concreta pioneer, Haroldo de Campos, which is anchored by a 2002 video from the Guggenheim Museum celebrating his life and work. Presented in conjunction with the exhibition Brazil: Body and Soul, this January 12, 2002 event featured both performances and discussion of de Campos' work by a wide variety of poets, translators and critics. The video begins with introductory comments by Pablo Helguera and organizer Sergio Bessa, who are followed by a staging of de Campos' 1950 poem/play "Auto do Possesso (Act of the Possessed)," translated by Odile Cisneros and directed by Cynthia Croot. Craig Dworkin is next, reading his translation of "Signantia quasi coelum / signância quase céu," follwed by a brief set by Cisneros, who reads her translations. The performances conclude with Marjorie Perloff and Charles Bernstein reading Bessa's translation of "Finismundo," after which Perloff and Bernstein take part in a panel discussion moderated by Bessa. On our Haroldo de Campos author page, you'll also find a link to Bernstein's 2003 essay "De Campos Thou Art Translated (Knot)", first published in the Poetry Society of America's Crosscurrents. 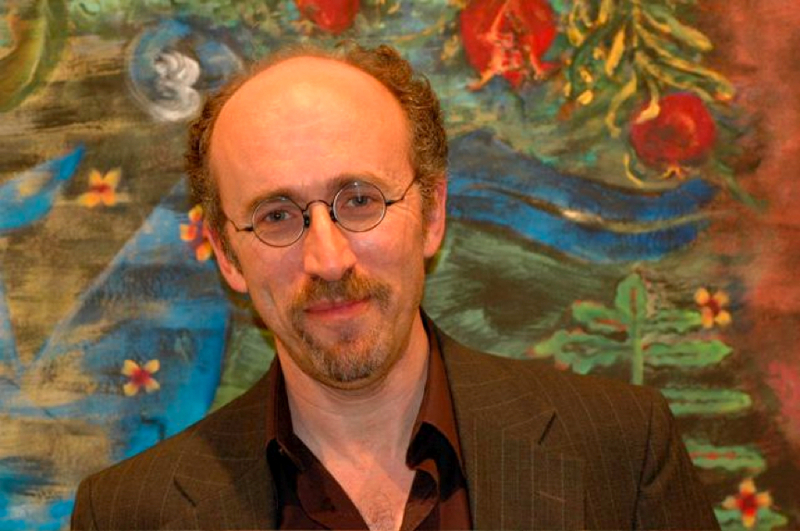 We couldn't be happier to formally announce today that the legendary Jerome Rothenberg has joined Jacket2's roster of commentators, migrating his wonderful "Poems and Poetics" blog from Blogger to our site. Al Filreis made the announcement today on his own J2 commentary page, and Jerry's most recent post — "From America a Prophecy: Anthology as Collage (Dekanawideh, Whitman, Pound, Stein)" — is front and center on the Jacket2 homepage. You'll find a number of earlier recent entries on his "Poems and Poetics" commentary home, and the complete four-year archive of Blogger posts has been crosslinked there as well. From his earliest publications as poet, translator and anthologist more than half a century ago, Jerry Rothenberg has redefined the way in which the world thinks about poetry and poetics, and so we're immensely proud to be able to share his latest writings with our readers. 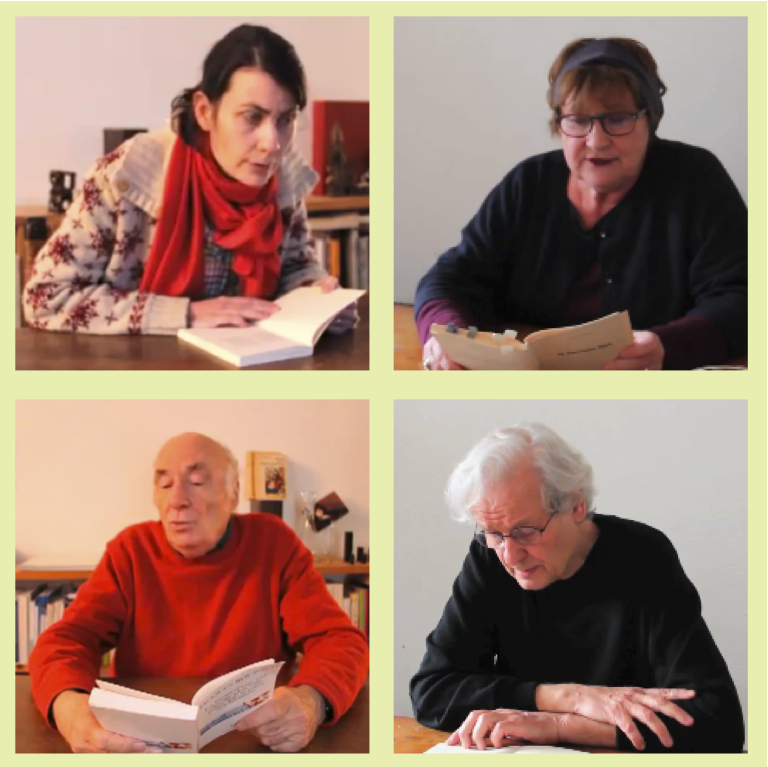 Today, we're highlighting four new author pages for contemporary French poets, each anchored by an intimate video reading filmed this year in Paris by "composer and occasional author, encyclopedist, movie maker, stage director and performer," François Sarhan. First up, we have Marie-Louise Chapelle sharing selections from Pronouncé second (Flammarion, 2010). 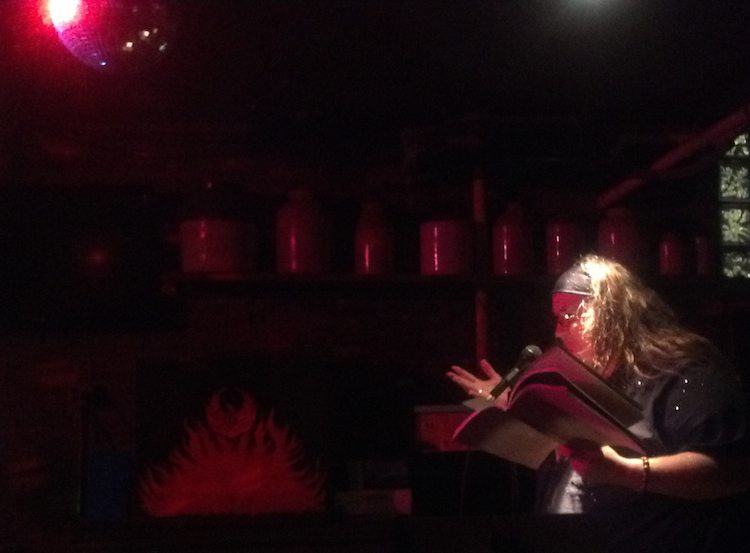 Next is Anne Portugal, reading from la formule flirt (P.O.L., 2010). She's followed by Jacques Roubaud, who reads excerpts from his recent collection, La forme d'une ville change plus vite, hélas, que le coeur des humains: Cent cinquante poèmes, 1991-1998 (Éditions Gallimard). Finally, Claude Royet-Journoud brings things to a close with "A la ressemblance des bêtes" from Théorie des prépositions (P.O.L. ), "Kardia" and "Asservissement de l'air à son vacarme." Charles Bernstein, who was responsible for bringing these recordings to the site, recently announced these films on Jacket2, and what's particularly wonderful here is that it marks the PennSound début for three of the four poets (Chapelle, Roubaud and Portugal). You can watch these videos on the individual authors' pages by clicking their names above. 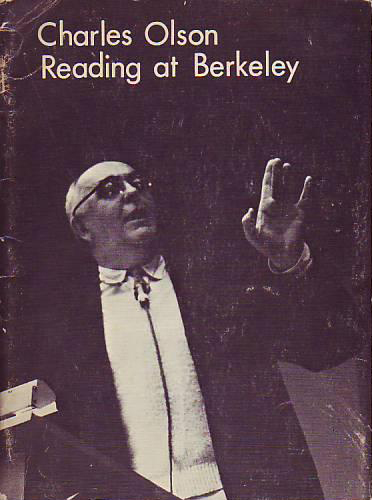 As we end the week, we're proud to announce a new recording found in the collection of tapes sent to us by David Levi Strauss — the legendary reading given by Charles Olson at the Berkeley Poetry Conference on the night of July 23, 1965. A transcript of this reading was subsequently created by Zoe Brown, and published under the title "Charles Olson Reading at Berkeley" by Coyote Press in 1966. Fueled by a bottle of liquor given to him by audience member Lew Welch, Olson delivers an explosive reading over the course of three-plus hours. Part performance, part address, part conversation, part autobiography, and part drunken rant, this is without a doubt one of Olson's great readings. Ostensibly, he reads from the following poems: "The Ring of" from In Cold Hell In Thicket; "An Ode on the Nativity" from In Cold Hell in Thicket (and as Olson notes, this is the first public reading of the poem — he previously hated it, but at Robert Creeley's insistence re-read it that morning and changed his mind); parts of Letters 5, 2, 9, and 10 from The Maximus Poems; and finally "On first Looking out through Juan de la Cosa's Eyes" from The Maximus Poems. 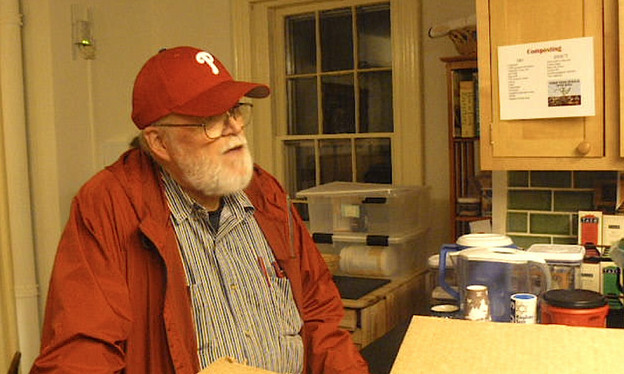 The recording also features a who's who of poets at the time interacting with Olson — besides Welch, Olson is introduced by Robert Duncan (who leaves halfway through the lengthy reading), and talks to Allen Ginsberg, Ed Sanders, and Robert Creeley, among others (most often responding to their repeated requests to continue reading poems). Olson talks about everything from his life in Worcester, Massachusetts, to his travels in Rome, presidents, politics, writing, publishing, performance, how many women he's had in bed with him at one time, and the different terms for "cod" in Portuguese and Italian. Despite his constant attempts to continue the reading, Olson is eventually told that the building the reading is held in will close in 20 minutes — the recording continues for another 30 minutes and cuts out after Olson has declared the reading over, but continues to read poems and tell stories. As Duncan says at the beginning of his introduction, "The man I am introducing tonight is a visibly large man." The spirit of this — of everything large about Olson, whether it be The Maximus Poems, his Projective Verse, his personality, or his profound effect on poetry in the past half-century, is contained in this monumental reading that is so expansive it defies adequate summation in the PennSound Daily. So take the time this weekend to listen to one of PennSound's true jewels. While I'm traveling with my partner Jennifer this week, I wanted to file one last PennSound Daily post before the Harriet-feted Jeff Boruszak takes over. No trip that begins with a 7:00 AM flight gets off to a gentle or auspicious start, and while our exhaustion was compounded by having to kill five hours before we could get into our hotel room, we were excited at the prospect of seeing CAConrad read in the East Village as part of the Litter reading series later that evening. A quick nap, a little more caffeine and were were on our way! This was the second-ever event for the Litter reading series, and the bill also included novelist Michael Cunningham, poets Stephanie Gray and Chad Frisbee and Mongolian activist/poet Byambakhuu Mike Darinchuluun. In this twenty-five minute set, Conrad read primarily from his latest book, A Beautiful Marsupial Afternoon, sharing both his somatic exercises and the resulting poems while bathed in the light of a mirror ball (turned on at his request), before closing with selections from The Book of Frank. The Litter event isn't the only new Conrad-centric recording up on the site today. Earlier this spring while I was visiting Philadelphia, I had the pleasure of a wonderful dinner with both Conrad and Frank Sherlock. Afterwards, warmed by good food and a lot of red wine, I set up my portable recorder and invited both poets to read a few pieces for PennSound. Conrad chose to read his recent chapbook, MUGGED into Poetry, while Frank shared a few rousing recent poems inspired by the Occupy movement: "Great Meetings in History (Zizek Remix)" and "Love Letter, November 15." To listen to all of the recordings mentioned above, click on the poets' names. Today we're happy to release two new sets of recordings, both two-disc CD releases, and both complete readings of books. For the soundscapes I improvised piano and voice as well as playing instruments in alternate ways: the viola with a glass fountain pen, the thumb piano with a viola bow, the ukelele for drumming and fretting and as a resonant chamber for voice. Tim Page recorded everything, adding background vocals, guitar chords, violin and bass notes. Our last recording was an audio walk in the city, playing bridges, grates, and leaves. Second is perennial favorite Lewis Warsh (shown at left), reading The Origin of the World (Creative Arts Book Company, 2001). The CD itself comes from a live reading of the poem at the Parkside Lounge in New York City, on March 26, 2002. It was read as part of The Long Poem Project, and the CD itself is produced in a collaboration between Deerhead Records and Ugly Duckling Presse (whose Matvei Yankelevich is also featured this week in the newest installment of PennSound co-founder Charles Bernstein's long-running series Close Listening). There have been a number of CDs uploaded into our archive in the past year, and we love making these professionally produced recordings available to you. Other recent releases include: Michael McClure's I Like Your Eyes Liberty, There's a Word!, and Love Lion; Cynthia Genser's Chinas Comidas; and Wilmar Silva's Musicacha. And of course, this is on top classics such as the Rockdrill Recordings, and LP's like The World Record and Allen Ginsberg singing The Songs of Innocence and Experience. Keep your eyes peeled in the future for even more of these fantastic productions. This weekend marks the six month anniversary of PennSound Radio. It's been wonderful working with PennSound Radio's Director Steve McLaughlin (also the Podcast Editor at Jacket2, as well as the coordinator for the Principal Hand Presents Reading Series) over this time, and I'd like to mark our anniversary with the announcement of a new permanent program in our rotation. "NewAtPennSound" will consist of a constantly rotating selection of the newest material to be added to our archive. NewAtPennSound can be heard at noon every day of the week. And afterwards be sure to stay for our current featured program, "Allen Ginsberg Reading at Naropa" at 1:00 PM — these fabulous recordings are not in our PennSound archive, so tune in and be sure not to miss them! We've been constantly expanding our selection of material these past few months, so both newcomers and faithful listeners will have something new to hear. To listen to PennSound Radio, you can either use iTunes by clicking on the "LISTEN NOW" button on the PennSound Radio page, or download the free TuneIn app on your smartphone or tablet, and take the programs with you wherever you go. Since the start of PennSound Radio, we've also launched a Facebook page, a Twitter Account, and a Tumblr, through which you can follow PennSound Radio's programming and keep up with our latest developments. We have more new programs and exciting features in the works, so be sure to listen in and follow us! Thanks for tuning in! Many Thanks to Jeff Boruszak! Now that I've finally made it home (after an unexpected day-long layover in Atlanta), I wanted to take the time to thank Jeff Boruszak for his wonderful PennSound Daily contributions in my absence. Jeff's been an indispensable member of the PennSound team since he started as my apprentice during the Spring 2010 semester, and since then he's worked for us continuously as a summer intern, workstudy and whatever other titles we've come up with. Though Jeff will be leaving the temperate confines of Philadelphia this August to begin doctoral studies at UT Austin, we're very glad that he'll maintain his affiliation with the site (which frankly wouldn't be the same without him). 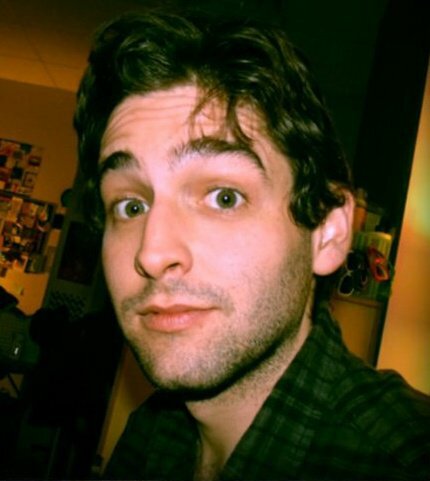 In addition to being a tireless digitizer and editor of poetry audio, Jeff's also a talented young poet, and I wholeheartedly suggest that you check out his recent recording as part of the Principal Hand Presents Reading Series, which include the epic techno-litany "[[WIKI]]," the meta-masturbatory "Poem for a Poet's Poet," the twin-poems "Weather" and "Whether," the Pound-channelling "Imitating Through Canto III," "#twitterpoem" and a non-rhyming limerick written at the tender age of sixteen. We're bringing this week to a close with a new addition to our already-venerable Cross Cultural Poetics series page: the six most-recent programs from Leonard Schwartz's radio juggernaut, which serve as a fine representation of the show's imaginative breadth. First up, is episode #252, "Autoimmunity," where Rodrigo Toscano and Eleni Stecopoulos read from their latest books (Deck of Deeds and Armies of Compassion, respectively). They're followed by episode #253, "Celan/Bronk," which begins with Pierre Joris discussing his translation of Paul Celan's The Meridian: Final Version — Drafts — Materials, followed by Schwartz reading selections from William Bronk's Bursts of Light: the collected later poems and composer Jonathon Newell, who discusses his recent piece, "String Quartet for Ballet Inspired by Poems by William Bronk." The full hour of episode #254, "Commonwealth," is devoted to political philospher Michael Hardt, who discusses Commonwealth, the final book in his and Antonio Negri's trilogy that also includes Empire and Multitude. We shift back to the musical mode for episode #255, "Butterfly/Borges," in which Peter Kazaras discusses his recent staging of Madama Butterfly with the Seattle Opera, followed by Suzanne Jill Levine, translator of Jorge Luis Borges' Poems of The Night. Next, in episode #256, "California," Stephen Motika discusses Western Practice, his new book inspired by maverick American composer Harry Partch, while Gillian Conoley reads from her chapbook, An Oh A Sky A Fabric An Undertow. 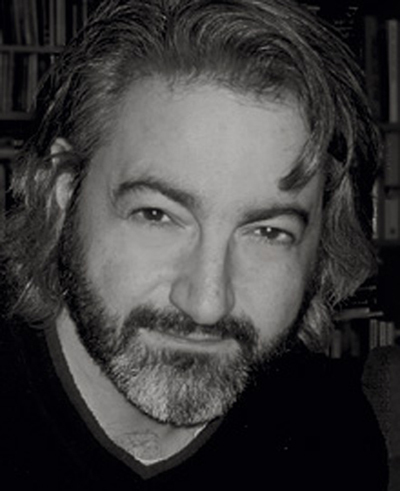 Finally, in episode #257, "The Page," Paul Vangelisti discusses his work on Piercing The Page: Selected Poems of Antonio Porta, and Murat Nemet-Nejat reads from his new collection, The Spiritual Life of Replicants. You can listen to all of these programs (and the previous 251) on PennSound's Cross Cultural Poetics series page. We continue our recent focus on international content — which includes new postings on Haroldo de Campos, François Sarhan's poetry videos and last week's new Cross Cultural Poetics programs — with a new PennSound author page for French poet and philosopher Philippe Beck. Beck's page is anchored by two videos from a reading that took place at New York's Empire State College on April 20, 2011. First up is a forty-eight minute bilingual reading from Poésies didactiques (Didactic Poetry, published by Théâtre typographique in 2001) with Nicola Martinez providing English translations of Beck's poetry. This is followed by a half-hour English-language discussion of Beck's writing and inspirations, featuring both poet and translator. To watch both of these videos, click on the title above to be taken to our Philippe Beck author page. PoemTalk 54: on Ron Silliman's "You"
It's 1995. January 1. Ron Silliman, who had carefully planned this daily year-long writing project, begins to write the first of what will be 52 sections of a series going under a title "You." He worries about the War in Chechnya, and writes a sentence on that, and about acid rain, and that gets a sentence. He remembers his dreams. He overhears intellectual coffeeshop talk. It's cold outside. This would be the 25th book of The Alphabet; in the Alabama edition of this major assemblage, twenty-five years in the making, "You" begins on p. 903, a long way in. Fifty-two sections, one for every week of 1995, each consisting of seven daily prose paragraphs, typically one, two or three sentences each. You write what you see, what you overhear, what news local (floods) or world (wars) occurs to you or impresses you, what you remember, what you know or think you know during these days. In one sense, "You" is the diary in New Sentences of a year. And it happens to have been a crucial annum for Silliman, who moved from San Francisco to Philadelphia. In section XVII (by our count, this would have been early May), "You" marks the poet's final week as a resident of the Bay Area. Certain birds (will you miss them?) wake him. Floppy disks might need to be copied (to secure files?) but aren't. Would Philly be a haven for you, such a bookish person? "Last chance to buy books." (Are there no good bookstores where you're going?) "To the question, 'Is your house lined with books,' I reply. 'No — stacked.'" Would the move from a region and a community that had productively tolerated — and also specifically encouraged — the emergence of a poetic style thwart or disorient the maker of these sentences? Section XVIII, dedicated to "Bob and Francie" (that would be Bob Perelman and Francie Shaw), locates Bay Area friends who'd gone East ahead of you. Despite such indications of continuity and familiarity — and despite the year-long project that must go on — you find a new landscape ("A cloudless sky but for the power plant. An old small town at the center of this development.") and a certain new anxiety over aesthetic belonging. Can a so-called "language poet" thrive in "P=H=I=L=A=D=E=L=P=H=I=A"? PoemTalk is a co-production of PennSound, the Kelly Writers House, Jacket2 and the Poetry Foundation. If you're interested in more information on the series or want to hear our archives of previous episodes, please visit the PoemTalk blog, and don't forget that you can subscribe to the series through the iTunes music store. Thanks, as always, for listening! This week comes to a close with a one-two punch from Canadian poet, composer and sonic provocateur Gary Barwin, with new content posted on both PennSound and Jacket2. First, we're very happy to unveil Barwin's Selected Works 1994-2012: a career-spanning collection of twenty-one tracks organized by the poet that includes collaborations with arraymusic, The Fires of Tonawanda, Laura Pin, Kalvos Komposer Kombat Ensemble, Geof Huth and Gregory Betts, along with a number of solo tracks. From the eerie woodwind percolations of "Psalm" to the blooming vocoder hymn "Future Moons," the deconstructed vocal fugue, "Semi-colon" or the skewed and funky "Dance inside the Huthmouth," there's something here for every listener here. We're very happy to be able to present these wonderful recordings, and hope to be able to add a few videos in the near future. Meanwhile, over at Jacket2, we've just released the latest installment of a.rawlings' Sound, poetry feature: "'R's Nova: Where does the [unintelligible] come from? ", a 2011 conversation at the Niagara Artists Centre, St. Catherine's, Ontario, between Jaap Blonk, Barwin and Gregory Betts, which is augmented with several video excerpts from the interview. This is the penultimate installment of rawlings' ambitous feature, which has also included conversations between Eiríkur Örn Norðdahl and Cris Costa, Maja Jantar and Oana Avasilichioaei, and Leevi Lehto and Carmel Purkis.